6A1-WG1059 - Zombie Slayer Recovery Crew Triple Edge Death Ninja Spike Nail. It features an all in one piece metal formed with three sharp blades and balanced with three short blood groves. It features an all in one piece metal formed with three sharp blades and balanced with three short blood groves. The 3.5 inch handle is all steel with a small cutout at the hilt with a nylon cord wrap. This Ninja Spike has a red finish with Zombie Slayer printed on the handle in Zombie Killer Green, it comes with a complete arm sheath. 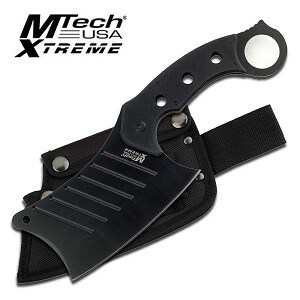 The sheath is made from 100% nylon and comes with two Velcro straps which go around your arm.